Dimensions: Base 3.5" x 6", Height 7.5"
Lightweight: less than a pound! Order one of our five "classic" colors, or customize your own for an extra $10. Please note, our classic colors are returnable, but custom bags are not returnable, as we cannot re-sell your unique fabric selection. Meet the Mini Zero Bag. A mighty marvel despite its size. The Mini Zero Bag is perfect for day trips, galavanting around and holding all your personal effects during your busy day. Made in the USA, especially for you, in our own San Francisco factory. The Zero Messenger is Rickshaw’s original and top-selling line the most conscientious messenger bags you’re going to find on the market. With its minimalist design, localized sourcing and minimal waste manufacturing, the Zero stops its ecological footprint in its tracks. We offer four sizes--from the Zero Mini for just the bare essentials to the Zero Large to accommodate a mobile office + kitchen sink-- so that you can tailor fit your everyday bag to your daily haul needs. All of our Zero messenger bags are made from scratch in our own San Francisco factory. "It's like a TARDIS, that little bag"
I've had my mini zero for a few years now and it's always my go-to bag when I'm traveling light. Today I took it with me on a 3 hour speedy day hike in Wales. When I got back into the village I'm staying in, I popped into the tiny local grocery just to see what they had and bought a box of crackers. I knew had a 10 pound note down at the very bottom of the bag, so I pulled out the rolled up raincoat I had stashed in there, and the knitted armwarmers, and the cycling water bottle, and the cashier laughed and said "It's like a TARDIS, that little bag." Over the years I have indeed found that it is a magical size - a smallish purse when lightly loaded and carrying a surprising volume when it's topped out. The velcro closure's length allows for some expansion so you can still secure your items even when they overflow the top of the bag a little. I recently added one more thing to my EDC life - Reading glasses. It now partners in my life with my phone, sunglasses, pocket knife, lip balm, note pad, pen, keys, mints, and wallet and occasional other random things. All stuff I need every day for life and operating a remote business. This bag is perfectly sized and manly enough to look the part. 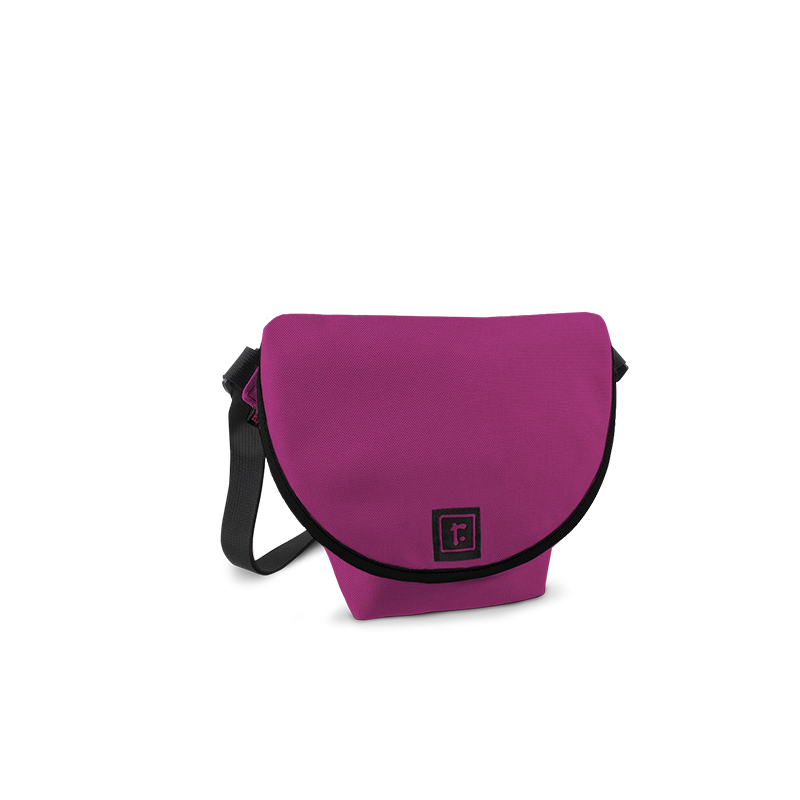 A messenger/camera bag look (I got it in black). So I don't really feel the need to justify it's man-bag-ness. It's awesome! The quality is amazing. The packaging and arrival was spot on. All great. The strap is the perfect length. Way to go Rickshaw! Thanks!